Where do I order quality prints for my clients? Where do I order albums without breaking the bank? What software do you use to design albums? Photo Packaging with your logo/brand. How to impress your clients with presentation! Who has the best business cards? Where do you purchase other marketing materials? Where can I buy quality overlays, guides, designs to help with workflow, management, etc.? How do I create collages and side by side images without going through photoshop? What's the easiest way to edit and add images to your blog/website? A step-by-step guide from the photo shoot, the editing, ordering prints, and every thing in between. Importing in Lightroom, exporting, managing images, uploading to proofing site, emailing the client, etc. Access to two photo galleries. *Using your camera...Tips and Tricks! *What's in my camera bag? A list of my equipment. *7 images with breakdown of camera settings for each image. 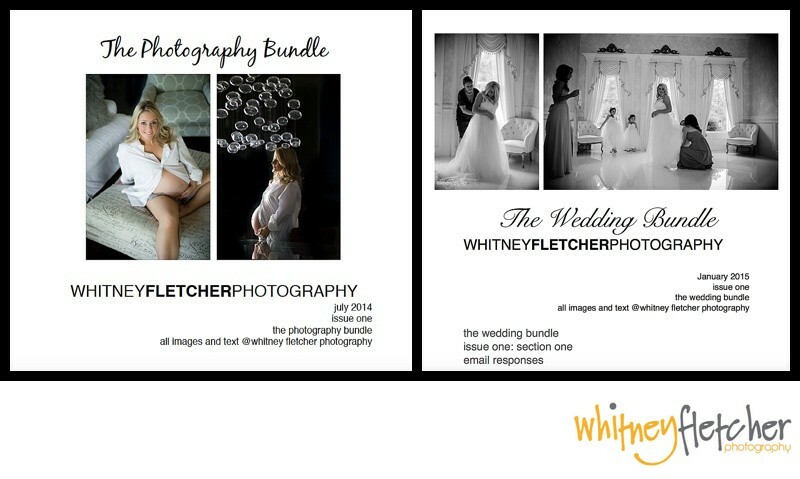 **Purchase The Photography Bundle AND The Wedding Bundle for $40.